Runs To Get Waisted: HOT DOG! I did it! This time for real! I got up this morning knowing that I was going to do a longer run, but I was not sure what that was going to look like or how far I was going to go. I was feeling tired and was trying to put off my run as long as I possibly could. I made myself breakfast, an English muffin with eggs and ham. I watched the new episode of "My Cat From Hell" on the DVR and stretched. Despite my best efforts to talk myself out of the run, I finally decided to just get up and get it over with! We went out with my aunt and uncle last night and I ate a couple of things I had not already preplanned, mainly a Ruby Jewel ice cream sandwich. They were all delicious and enjoyed, but I knew that I needed to pay the piper for it. The temperature wasn't too bad, it was in the 50's, however it rained the entire time I was running. I brought a water bottle with me but almost didn't need it since the moisture in the air was practically keeping my skin and mouth hydrated. I was surprised to find that once again my lung capacity felt incredible, and my legs felt like they could go on forever. I decided to take a walk break after mile 1 to save my legs for whatever distance I was going to do (I still hadn't decided a mile into the run!) At first I said to myself that I would do five miles again, since I did so well the other day. Then I was like, "Well, but you really should be doing a longer distance on the weekend, so you should do 6". Then my brain said reproachfully, "You DID have that Ruby Jewel last night when you intended to get a smaller dessert. Plus you were supposed to run 7 miles last week and you didn't even come close to that. Do 7." Yes, I am a crazy person and have a constant dialogue with myself when I am running! So it was decided, I was going to do 7. I passed the road last week where I turned around, the road that according to Run Keeper meant I'd gone 3.5 miles. I looked at my Garmin and it said 2.72 miles!! (Yikes, that meant I'd run even LESS than I thought last week.) With every beep of my Garmin signaling another mile passing, I continued to run, continued to feel good and continued to be amazed. I felt so good that I briefly considered doing 8 miles, but I decided to keep it at 7 miles, which was already further than I have ever run in my life! The last half mile was probably the worst, and it made me so happy I stuck with the 7 mile goal! My legs were pretty shot towards the end, not with pain so much, but I was just very tired and had raging heart burn. When that 7 mile notification beeped, I wanted to dance! As I said, it's the most I've ever run in my entire life. 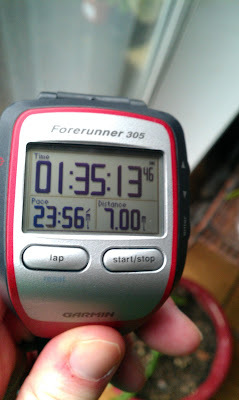 I would have fainted at the thought of doing 7 miles back in January, but this actually wasn't that bad!! I rewarded myself with a dinner that I have been ridiculously craving for a month...I don't know why, but I have wanted a damn hot dog so bad! I have not been able to stop thinking about them! Since I earned a pretty hefty amount of PP for my run today, I decided to go for it and have a couple of Kosher hot dogs complete with sauerkraut, relish and mustard. I enjoyed every bite of them too!! And I MAY have gotten another Ruby Jewel sandwich to enjoy tonight for dessert. Just maybe. Awesome!! So Proud of you!! And you totally earned your hotdogs, lol! Way to go!!! I love that we are both the same speed. Our route at run club this morning planted us at 6.6 miles. Now I'm wishing I'd run around the block a couple times! And now I'm craving a hotdog with all those same condiments plus onions. Thanks everyone! Yeah it's funny, I had my two hot dogs and that was it, the craving was gone. Sometimes you just have to go there. I was almost more excited by the kraut/relish we bought. It was this brand called Bubbies, and it was SO GOOD. I could have eaten the whole jar of kraut by itself. The way they canned it was without a bunch of preservatives, and the cabbage was still crunchy almost. So good. And on the run, the part that excited me the most is that I had NO pain today. Usually at the very least my foot will be a little tender. Nothing though!